Following the landmark Trump–Kim summit, analysts quickly began speculating about what could realistically be achieved in the way of denuclearisation. A scenario where North Korea freezes its nuclear program and reduces, but doesn’t entirely eliminate, its nuclear arsenal and facilities has been offered  as an imperfect but nonetheless workable outcome. Yet the reality is that partial disarmament is unlikely to do much to ease regional tensions. Pre-summit calls by the US  for complete verifiable, irreversible denuclearisation were never going to materialise. Kim Jong-un fears that giving up his nuclear weapons would leave him vulnerable to suffering the same fate that befell Saddam Hussein and Muammar Gaddafi. He also seeks the international prestige that comes with being a nuclear-weapon state. 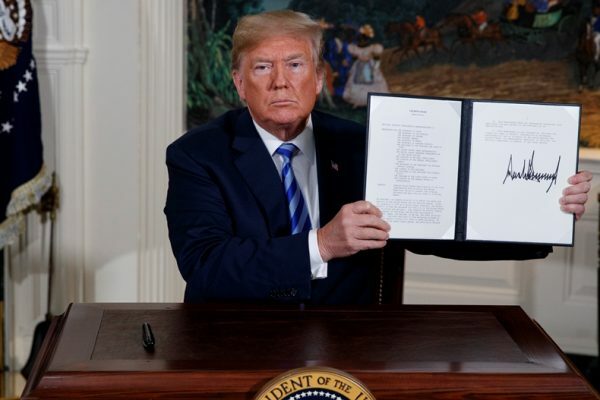 Donald Trump’s decision to walk away from the Iran deal and his appointment of John Bolton—a longtime advocate  of regime change in Pyongyang—as national security adviser have done little to improve trust between the two nations. Accordingly, Kim has advocated a ‘phased’ and gradual approach to ‘denuclearisation’ (or at least what he understands  denuclearisation to mean), whereby any steps by Pyongyang are met with simultaneous concessions from Washington. Nobody outside of the hermit kingdom knows for sure how many nuclear weapons North Korea has, or, crucially, whether it has the capacity to launch a long-range nuclear missile strike. Various estimates  suggest that it has up to 60 nuclear weapons and large uranium stockpiles. The latest series of missile tests suggest that it possesses ICBMs that are theoretically capable of targeting US territory. However, there are several signs  that Kim is serious about improving North Korea’s economy and ending his country’s international isolation. Kim’s no fool, and he knows there’s no such thing as a free lunch. Trump is hypervigilant about avoiding  what he perceives to have been the overly concessionary approach of the Obama administration, and Kim will have to take concrete steps towards denuclearisation in exchange for any meaningful concessions. It is against this backdrop that some have cautiously suggested  that Pyongyang will freeze its nuclear program and eliminate part of its arsenal, leading to a more stable Korean peninsula. But, assuming partial disarmament occurs, would it actually do much to ease regional tensions? To answer that question, we need to think about what a reduction of North Korea’s nuclear arsenal would look like in practical terms. While Kim may be more set on economic growth and integration into the international community than his father and grandfather were, it’s difficult to imagine that he would fully trust American security guarantees—even after a long, drawn-out period of mutual concessions. As Gaddafi learned , talk can be cheap. It’s unlikely that the North Koreans will give up a sizeable proportion of their arsenal, or their trump card—the Hwasong-15, the ICBM potentially capable of reaching the American mainland. Any large reductions would also undermine Kim’s pursuit of international prestige. North Korean disarmament will probably at most be limited to the elimination of nuclear warheads and production facilities deemed to be superfluous. Perhaps the most tangible benefit Washington can hope for is that a freeze in Pyongyang’s nuclear program will stop it perfecting the technology needed to carry out a successful strike using the Hwasong-15 missile. While Trump will hail any North Korean concessions as proof of his own negotiating genius, formally accepting Pyongyang as a nuclear power by lifting sanctions and normalising relations would undermine US credibility and be politically disastrous domestically, while sending a dangerous, encouraging signal to other countries thinking about developing nuclear weapons. In the event that Pyongyang fails to denuclearise, Washington will likely return to something resembling the ‘maximum pressure’ approach. Even if North Korea takes steps towards disarmament at some point, we will likely return to square one, where the possibility of conflict cannot be ruled out—especially if Pyongyang recommences nuclear tests. Reinstalling or ramping up sanctions against Pyongyang would likely further polarise the Northeast Asian security environment. Japan—which has expressed misgivings  about Trump’s diplomatic approach—doesn’t want another nuclear-armed neighbour and would almost certainly support Washington. However, China and Russia—which are more concerned with maintaining stability than with seeing a denuclearised North Korea—may be unwilling to return to squeezing the Kim regime, especially if Pyongyang takes genuine steps towards disarmament. South Korea’s position would be more ambiguous and would largely hinge on the extent of Pyongyang’s disarmament and whether the dovish Moon Jae-in remained in power. Any North Korean steps towards denuclearisation should ultimately be encouraged. But, given the current political dynamics, anything short of full denuclearisation—although preferable to the tensions of 2017—is unlikely to pay significant peace dividends. Henry Storey is an analyst at Foreign Brief. Image courtesy of Flickr user 禁书 网.